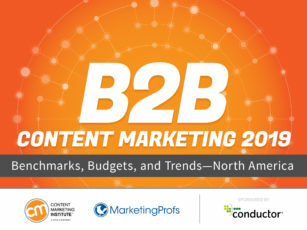 CLEVELAND, Ohio, Oct. 10, 2018 (GLOBE NEWSWIRE) — The Content Marketing Institute (CMI) research team is doing a happy dance over the newly released B2B Content Marketing 2019: Benchmarks, Budgets and Trends—North America report produced with our friends at MarketingProfs, and sponsored by Conductor. This is the ninth year for the research, among the most cited content marketing research in the world, which provides insight on how organizations can take B2B content marketing to the next level. We also made a significant change to our methodology this year to give us a more experienced pool of practicing content marketers to survey. 90% of top-performing B2B content marketers say they put their audience’s informational needs ahead of their company’s sales/promotional message. Another key finding is that B2B content marketers primarily use email (87%) and are providing educational content (77%) to nurture that audience. Additionally, 45% use storytelling and other ways to “relate” to nurture their audience. 96% of the most successful content marketers agree that their organizations have built credibility and trust with their audience. Well-researched personas can help teams create successful content; however, too few content marketers are actually talking with customers to understand their needs (42%). Content creation is the area of content marketing where there has been the most reported increase in spending over the last 12 months (56%). Changes to SEO/search algorithms is the top content marketing issue of importance to organizations (61%), followed by changes in social media algorithms (45%), and content marketing as a revenue center (41%). MarketingProfs is the most trusted name in marketing education, giving marketers worldwide the tools and training they need to exceed their goals. Its on-demand training, live online events, and in-person conferences help individuals, small teams, and large teams increase efficiency, productivity, and (best of all!) revenue. Find out how learning can change your life: marketingprofs.com.